Well, you can't have both a full-fledged desktop operating system and terrific battery life, right? Right. And by the looks of it, Microsoft won't be trying to change that with its Surface tablet, powered by Windows 8 Pro. According to some unofficial reports, the Surface Pro tablet is likely to offer about half the battery life of its RT counterpart. Of course, no one should have expected the Intel-powered Surface running full-featured Windows to be as power-efficient as the ARM-based Surface RT, so we guess there won't be too many disappointed. Besides, if you choose to pair your Surface Pro with a keyboard dock, you end up with a real laptop, and you know how good laptops are with regards to battery life. Still, it might not be a bad idea for Microsoft to take a page out of Asus's book here and comes up with a keyboard dock that also incorporates an additional battery. That said, with the Surface RT sporting a battery life close to 8-10 hours on average, the Surface Pro may easily hover around the 4-5 hours mark. Not that bad, but not great either. The difference is the Transformer has a huge battery in its keyboard dock, whereas the Surface's keyboard dock is just a keyboard. I don't care about battery life all that much, and I am planning on picking up a Surface Pro when it launches, but 4-5 (i.e. 4 hours) is still pretty disappointing. Can someone design a back cover/kickstand with a efficient solar panel so the tablet can be charged while you are using it? The main problem is market perception of Surface Pro. It shares it's firt name with Surface RT and therefore it's percieved like a tablet. But in fact, despite tablet-like features, it's in fact a full mobile PC, that competes with ultrabooks. Therefore its should be compared with ultrabooks, not portable devices like tablets. Problem that Microsoft has to deal with is that all eyes are aimed at the fact that this Pro version is Microsoft's edge over the competition in mobile tablet world, not in a PC world, but this model obviously cannot compete in tablet world. Real tablet is something you feel easy and natural to hold. Two pound hybrid is not such thing ..the most natural place for it is lap(while used in a sitting position) or torso (while used in a laid position). Hence, it will most be used in an ultrabook configuration. The fact that microsoft on their own website calls it "is a 64-bit tablet PC" makes it seem that the word, "tablet" is right there for comparisons with other tablets. Right, Anand Shimpi also recommended to wait for haswell...iintel has some power saving features coming in. the sad thing about intel laptops... only have 5hrs life! which is understandable since it give pure power! I'll wait for the next generation of the Surface pro. me too!!! coz that rumor mill about surface family is interesting!! !coz this dont really give me a huge impression coz of that low res screen! but will prefer the surface RT 2 coz 8.6" will be very good for me! coz the surface pro2 with 11.6" is huge..but still not that big!! 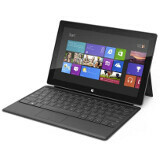 i mean most windows 8 tablet are 11.6 above (vaio 11 duo, etc)... but still it will be great!